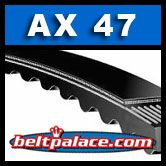 AX47 Industrial V-Belt. Cogged AX Series. AX47 Industrial V-Belt. Cogged AX Series. 49" OC x 1/2" W. Premium industrial grade.